The Performing Arts Center of Los Angeles County, often referred to simply as the Music Center, is one of the three largest performing arts centers in the United States, along with Lincoln Center and the Kennedy Center. Located in downtown Los Angeles, the Music Center is home to the Dorothy Chandler Pavilion, Ahmanson Theater, Mark Taper Forum, and more recently constructed Walt Disney Concert Hall. Each year, the Music Center welcomes more than 2.3 million people to performances by its four internationally renowned performing arts companies: Los Angeles Philharmonic, Center Theatre Group (CTG), the L.A. Opera and Los Angeles Master Chorale. The Music Center's current mission is to go beyond its role as a musical venue and serve as a bridge between cultures. As such, the Music Center's most recent additions (both in programs and structures) have sought to facilitate this, emphasizing cross cultural values and art through their Active Arts program. For this, the Music Center is renowned in the local Los Angeles area, as well as nationally and internationally. Through its work, the center emphasizes the fact that music and art can do much to bring people together in peace. In March of 1955, Mrs. Dorothy Chandler began fundraising toward a permanent home for the Los Angeles Philharmonic. Ultimately, Mrs. Chandler raised almost $20 million in private donations; Los Angeles County provided the site and raised the remaining $14 million using mortgage revenue bonds. According to Stephen D. Rountree, President and CEO of the Music Center, "Dorothy Chandler's vision was to create a cultural center that would always remain relevant to the city." To facilitate this, in 1960, Chandler campaigned for additional theaters to be added to the center, convinced that one would not be enough to showcase a rich array of cross cultural genres and performances. She wanted it to house space not only for symphonic music and opera, but also chamber music, traditional theater, and experimental programs. When the Dorothy Chandler Pavilion opened its doors on December 6, 1964, the twenty-eight year old Zubin Mehta led the Los Angeles Philharmonic in a program that featured violinist Jascha Heifetz, performances of Strauss' Fan Fare, and Beethoven's Violin Concerto in D Major. The rest of the complex was completed in April of 1967. 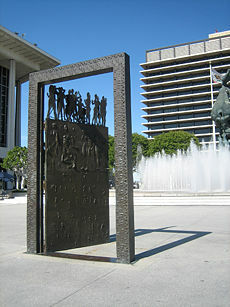 The additional venues, Ahmanson Theatre and the Mark Taper Forum, were dedicated on April 12 and 19, 1967, respectively. Chandler reportedly raised 18.5 million dollars nearly single-handedly. The Mark Taper Forum was famous for "scandalizing the power structure of Los Angeles," according to its artistic director Gordon Davidson, with its provocative opening production of John Whiting's The Devils. The Ahmanson Theatre opened with a performance of the Man of La Mancha by the Civic Light Opera. The first dramatic season at the Ahmanson featured Ingrid Bergman in O'Neill's More Stately Mansions, signaling its intent to marry big-name playwrights with big-name stars. Over the last thirty-eight years, the Music Center has seen the American debuts of Simon Rattle and Esa-Pekka Salonen, the world premieres of The Shadow Box, Zoot Suit, Children of a Lesser God, and Angels in America at the Taper, and performances by Jessica Tandy, Hume Cronyn, Katharine Hepburn, and Maggie Smith at the Ahmanson. The Philharmonic and L.A. Master Chorale joined forces to provide the accompaniment to Eisenstein's restored silent film classic, Alexander Nevsky. While the Los Angeles Civic Light Opera held its final Music Center Season in 1987, the Los Angeles Music Center Opera was formed in 1986. Productions by the Opera have included Wagner's Tristan and Isolde, directed by Jonathan Miller and designed by David Hockney. There are four main venues of the Los Angeles Music Center complex. Located on the south end of the Music Center Plaza, the Dorothy Chandler Pavilion boasts one of the largest stages in the United States. With over 3200 seats, the Dorothy Chandler Pavilion is the centerpiece of the Los Angeles Music Center complex. It is famous for four elegant tiers, with chandeliers, wide curving stairways, and rich decor. Construction began on March 9, 1962, and the site was dedicated on September 27, 1964. Its opening performance was that of Fanfare, by Richard Strauss, 'American Festival Overture, by William Schuman, Roman Festivals by Ottorino Respighi, and Beethoven's Violin Concerto. Before the creation of the Los Angeles Opera company in 1986, the New York City Opera would often perform at the Pavilion. From 1969-1987, the Academy of Motion Picture Arts and Sciences held its Academy Awards there, and again in 1990-1994, 1996, and 1999. The Dorothy Chandler Pavilion is currently home to the Los Angeles Opera and the Dance at the Music Center. The Mark Taper Forum, an intimate 750-seat theater, opened on April 9, 1967, after construction began on March 9, 1962. Its opening play was that of The Devils, starring Frank Langella and Ed Flanders. The stage as known as a thrust stage, with the auditorium's seats surrounding it on three sides. The Mark Taper Forum is known for its diverse and experimental works and has been honored numerous times for its development of new plays and voices in the world of theater. In 1977, it won the special Tony Award for theatrical excellence. Construction on Ahmanson Theatre began on March 9, 1962. Its opening performance of More Stately Mansions, starring Ingrid Bergman, Arthur Hill, and Colleen Dewhurts, took place on April 12, 1967. The site was renovated and rededicated in 1994, providing a new, variable seating capacity of anywhere between 1600 and 2000. Its boasts a classic proscenium stage designed for large musicals and plays in a three level configuration: There is a main floor orchestra level, a mid-level Mezzanine, and an upper balcony section. It can, therefore, accommodate a great variety of plays. The Ahmanson currently enjoys the largest theatrical subscription base on the West Coast of the United States, in a year-round season from early fall through late summer. On October 23, 2003, the Music Center opened the Frank Gehry-designed Walt Disney Concert Hall, expanding the campus to 11 acres. The 2,265-seat Concert Hall is home to the Los Angeles Philharmonic and the Los Angeles Master Chorale. 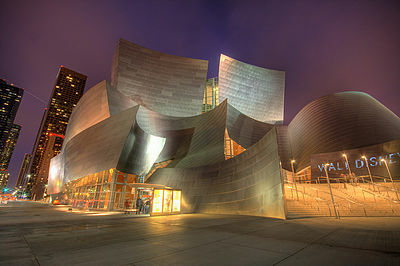 Walt Disney Concert Hall includes the 266-seat Roy and Edna Disney/CalArts Theater (REDCAT) and outdoor program areas including the W.M. Keck Foundation Children’s Amphitheatre, seating 250-300, and the Nadine and Ed Carson amphitheater, seating 120. The project began in 1987, when Lillian Disney, widow of Walt Disney, donated $50 million dollars for the concert hall's construction. Los Angeles County provided $110 million to construct a parking garage that would be located underneath the structure. The garage was completed in 1996. The concert hall was completed in 2003, after fundraising stalled during the housing depression of 1994-1996. Upon completion, the entire project was estimated to have cost $274 million. The acoustics of the concert hall were highly praised upon the Philharmonic's first performance there in fall of 2003. The concert hall is also home to a very large concert organ, built by German organ builder Casper Glatter-Gotz under the tonal direction of Manuel Rosales. The organ was a gift from Toyota Motor Company, out of Japan. Founded in 1919, The Los Angeles Philharmonic, has a roster of about 105 musicians and holds a 30 week seasons of concerts each year in the Walt Disney Concert Hall, and a 12 week summer festival at the Hollywood Bowl, where they first performed "Music Under the Stars" in 1922. The orchestra is also involved in programs with schools, churches and other organizations in the Los Angeles area. Multi-millionaire William Andrews Clark established the Los Angeles Philharmonic as the first standing orchestra in Los Angeles. After its first season, the orchestra spent 44 seasons in Philharmonic Auditorium before moving to the Dorothy Chandler Pavilion in 1964. When the Walt Disney Concert Hall opened in 2003, the orchestra moved to the new hall, at the same time expanding their winter concerts, which now include jazz, world music and a variety of other programming, in addition to a wide range of classical repertory. The Philharmonic's list of past musical directors includes such outstanding conductors as Otto Klemperer (1933-1939), Zubin Mehta (1962-1978), and André Previn (1985-1989). Beginning in 1967, a few years after the Music Center opened, the Center Theatre Group of Los Angeles began presenting a wide variety of high-quality award-winning performances, with treasured classics and innovative premieres; musicals, comedies, and dramas, including five Neil Simon world premieres, and a record-setting four year run of Phantom of the Opera in the Ahmanson Theatre and the Mark Taper Forum. Some shows co-produced by Center Theatre Group have also been successful on Broadway, including Smoke Joe’s Café, August Wilson’s The Piano Lesson, and Two Trains Running, and Frank Loesser’s The Most Happy Fella. Recently, the Group opened a third venue, the 317-seat Kirk Douglas Theatre. Under the direction of General Director Plácido Domingo, in the short few decades since its founding in 1986, the The Los Angeles Opera has grown to become the fourth largest opera company in the United States. With an impressive repertory of grand opera productions including Otello, Tristan und Isolde, The Magic Flute, and Rigoletto, as well as contemporary operas, the company presents 70 to 80 performances a year, and sponsors a variety of education and outreach programs. Founded in 1964, simultaneously with the opening of the Music Center, the Los Angeles Master Chorale is now a resident company in the Walt Disney Concert Hall. Performing independent choral concerts about fifteen times a year, the Chorale also presents joint concerts with the L.A. Philharmonic and has been featured on a number of Hollywood movie soundtracks, including A.I. Artificial Intelligence, My Best Friend's Wedding, Bram Stoker's Dracula, Sum of all Fears and Waterworld. 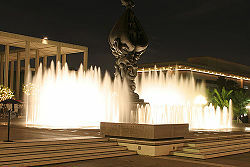 The courtyard of the Los Angeles Music Center contains a number of fountains and sculptures for patrons to enjoy before performances and during intermissions. The Dance Door by Robert Graham. Peace on Earth by Jacques Lipschitz. On Sunday afternoon, May 4, 1969, Peace on Earth by Jacques Lipchitz was dedicated. His sculpture portrays a dove descending to earth with the spirit of peace, symbolized by the Madonna standing inside a tear shaped canopy, supported by a base of reclining lambs. Lawrence E. Deutsch and Lloyd Rigler donated $250,000 to commission a work to be placed in the fountains on the Music Center's courtyard. 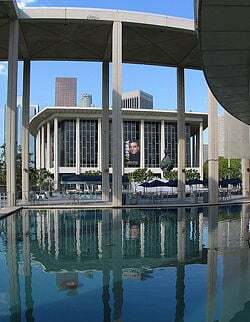 The architects of the Music Center, Welton Becket and Associates, opposed placing sculpture in the plaza between the Dorothy Chandler Pavilion and the Mark Taper Forum. 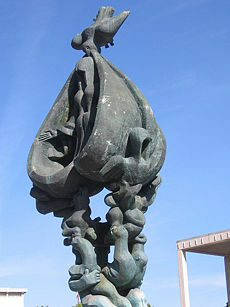 However, after a two year search, the Art Committee of the Music Center prevailed, and commissioned Lipchitz to create the sculpture, now the most photographed work of public art in Los Angles. The Dance Door, a bronze sculpture created in 1978 by Robert Graham, and donated to the Music Center in 1982, by Frederick and Marcia Weisman, consists of an ornamented life-size bronze door, hinged on a bronze frame and locked in an open position. The door itself is hollow centered and composed of approximately 7 welded case panels on each side. Abstract figures of dancers are cast in low relief on the door panels. The Music Center is governed by a Board of Directors chaired by John Emerson (2003). Center President and Chief Operating Officer is Stephen D. Rountree (2002). The County of Los Angeles owns the Music Center and provides funding for its maintenance, operations, grounds-keeping, security, and ushers. Revenue from the operation of the Center garage offsets these expenses. The Music Center and the four performing arts companies are responsible for the productions presented in the theaters. The Music Center maintains and operates the buildings and the grounds and oversees occupancy of the theaters, restaurant facilities, and the Music Center Archives. Since its inception in 1979, Music Center and Family Programs has served more than 16 million and currently serves nearly 1 million students and teachers each year. The Music Center believes the arts enhance the lives of all people and are crucial to the development of every child. The Music Center-designed curriculum materials are included in art textbooks published by McGraw Hill in use across the country. Education and Family Programs events include World City, Pillow Theatre, Performing Books, the Chandler Children’s Festival, the Family Festival, the Very Special Arts Festival, the Spotlight Awards, and the Bravo Awards. Launched in July 2004, and designed to expand the public’s experience associated with the performing arts, Active Arts at the Music Center extends beyond the more formal experience associated with performing arts centers. Active Arts programs engage people from diverse backgrounds and experiences and establishes an ongoing series of admission-free or low-cost recreational art-making events that encourage people to sing, dance, play music, and tell stories together just for the sheer enjoyment and love of the art. Active Arts programs cut across cultural boundaries, as well. For example, the dance program offers a "Taste of Dance" class, in which patrons are exposed to dances with origins all over the world. Another example is the "L.A. Storytellers" seminar, in which people of Los Angeles' diverse cultures are encouraged to tell their stories. In 2007, the active arts program received a grant of $800,000, distributed over three years. The program encourage people to participate for the sole purpose of art-making and include Dance Downtown, Drum Downtown, A Taste of Dance, Get Your Chops Back, Friday Night Sing-Along, and Jingle Bell Sing. In essence, the goal of the program is to expand the image of the Music Center, from performing arts center, to civic cultural center, using the arts and public spaces to bridge and build the community. The fountains outside the Dorothy Chandler Pavilion. Over the past five years, the Music Center has developed an ambitious dance presentation program, which has established a distinguished reputation—locally, nationally, and internationally. The endeavor began in 2000, with the Music Center’s sold-out presentation of the Bolshoi Ballet in its historic production of Prokofiev’s Romeo and Juliet, as well as new interpretation of Don Quixote. Since then, the Music Center has presented a broad array of ensembles, including New York City Ballet, San Francisco Ballet, American Ballet Theatre, Dance Theatre of Harlem, Alvin Ailey American Dance Theater, Beijing Modern Dance Company, Merce Cunningham Dance Company, Kirov Ballet of the Mariinsky Theatre, Nuevo Ballet Español, Miami City Ballet, and Eifman Ballet of St. Petersburg. The Blue Ribbon, founded by Mrs. Chandler in 1968, has a membership of more than 625 women who champion the performing arts and make substantial financial contributions to the Center's community programs and its resident companies annually. Club 100, founded in 1976, is a group of dynamic professional and civic-minded women who promote the Center's goals through education, advocacy and fundraising. Club 100 sponsors the annual BRAVO Awards, which recognize exemplary arts educators. The Fraternity of Friends, founded in 1978, consists of businessmen and entertainment industry leaders who share an interest in the performing arts and the well-being of the Music Center. Center Dance Association (CDA) is dedicated to promoting educational programming related to dance, expanding dance audiences in Los Angeles and creating special events related to dance for the enjoyment and further education of its membership. ↑ 1.0 1.1 1.2 Ryan Jimenez, The Making of a Cultural Icon, Los Angeles Music Center. Retrieved August 20, 2008. ↑ William Dudley Hunt, Total Design: Architecture of Welton Becket and Associates (New York: McGraw-Hill Book Company, 1972, ISBN 9780070312982). ↑ Teresa Grimes and Tavo Olmos, Historic American Building Survey for the Performing Arts Center of Los Angeles County (Los Angeles, Calif: Music Center, 2002, OCLC 52428356). ↑ 4.0 4.1 Los Angeles Music Center, Dorothy Chandler Pavilion. Retrieved August 20, 2008. ↑ Los Angeles Music Center, Mark Taper Forum. Retrieved August 20, 2008. ↑ 6.0 6.1 Los Angeles Music Center, Ahmanson Threatre. Retrieved August 20, 2008. ↑ Frank O. Gehry, Richard Koshalek, D. Borda, et. al., Symphony: Frank Gehry's Walt Disney Concert Hall (New York: Harry N. Abrams in association with the Los Angeles Philharmonic, 2003, ISBN 9780810991224). ↑ Los Angeles Philharmonic, History of the Los Angeles Philharmonic. Retrieved August 20, 2008. ↑ Center Theatre Group, History. Retrieved August 20, 2008. ↑ L.A. Opera, History. Retrieved August 20, 2008. ↑ Los Angeles Master Chorale, About the Chorale. Retrieved August 20, 2008. ↑ Public Art in Los Angeles, Public Art Works in the Los Angeles Civic Center and the Los Angeles Mall. Retrieved August 20, 2008. ↑ G. Wharton, A Survey of Important Sculptures in Los Angeles County (Sculpture Conservation Studio, Inc). ↑ James Irving Foundation, Performing Arts Center of Los Angeles County. Retrieved August 20, 2008. Garrison, Lee C., and Christina Vogl Kaali-Nagy. Comparative profiles of users and nonusers of the Los Angeles Music Center. Los Angeles: Graduate School of Management/Division of Research, University of California, Los Angeles, 1971. OCLC 26835481. Gehry, Frank O., and Richard Koshalek. Symphony: Frank Gehry's Walt Disney Concert Hall. New York: Harry N. Abrams in association with the Los Angeles Philharmonic, 2003. ISBN 9780810991224. Grimes, Teresa, and Tavo Olmos. Music Center: Historic American Building Survey for the Performing Arts Center of Los Angeles County. Los Angeles: Music Center, 2002. OCLC 52428356. Hunt, William Dudley. Total Design; Architecture of Welton Becket and Associates. New York: McGraw-Hill, 1971. ISBN 9780070312982. Swed, Mark, and Nancy Zaslavsky. Celebrating Twenty Five Years 1964-1989. Los Angeles: Music Center of Los Angeles County, 1989. OCLC 25427375. Wharton, Gless and Associates. A Survey of Important Sculptures in Los Angeles County. Los Angeles: Sculpture Conservation Studio, Inc., 1998. History of "Los Angeles Music Center"
This page was last modified on 25 July 2018, at 16:25.